Sandwiched between Israel and Syria, Lebanon is a green and white jewel on the Mediterranean Sea. The green comes from Lebanon's humid and semi-tropical climate along the coast and the springs flowing down from the mountains. The white is from the limestone covering most of the country. The white mountains are so dramatic that the country's name, Lebanon, shares its root with the Semitic word for white. This breathtaking scenery and geology make Lebanon a great place to visit  where you can ski at 2,000 meters in the morning and swim in the warm Mediterranean Sea in the afternoon. Lebanon's tiny size  10,400 square kilometers  is a boon to the traveler. The country can be reached by air on several international carriers, or by land from Syria, and American citizens can get a visa upon arrival for U.S.$35. Lebanon's reputation as a resort destination collapsed during its 16-year civil war (which involved surrounding countries including Syria and Israel, and resulted in the kidnapping of Americans and Europeans in the 1980s by jihad groups), but the country has made a rapid recovery and now welcomes tourists. 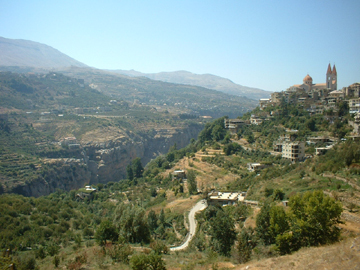 The town of Bcharre rests on the edge of a cliff, and features a rock-cut monastery owned by writer Khalil Gibran. In the winter, the area is a popular destination for skiers. Photos by Kimberly Krieger. The far corners of the country are accessible as easy day trips from Beirut or Tripoli by bus or service taxi. Once at a destination, hiking around on foot is the best way to examine interesting features of the landscape. When you're ready to go back, just stand on the side of the road and hail a bus going in your direction  it's how the Lebanese travel, too. Although a few travelers have bicycled through the country, the mountainous terrain makes it difficult to cover ground quickly and local political conflicts make bicyclists objects of suspicion in southern Lebanon and the Bekaa Valley. Still, English and French are widely spoken, and the Lebanese are very friendly, making navigation around the country easy. Beirut, which cascades down Mount Lebanon to the Mediterranean in a jumble of blazing new skyscrapers, Italianate villas and collapsing apartment buildings, is the logical place to start your geologic tour because of its close proximity to the international airport. The prime geological attraction in Beirut is the museum at the American University (AUB). Stop by to admire the beautiful campus and museum, open 9:00 a.m. to 5:00 p.m. Monday through Friday. The lower level has a comprehensive display of the country's archeological treasures, and the upper floors hold a fascinating overview of Lebanese geology. The walls are covered in scale maps of Lebanon's structure, detailed satellite imagery of the region, and interesting historical records of seismic activity, natural disasters and water resources in Lebanon and the rest of the Middle East. AUB also has several examples of Lebanon's rare fish fossils. When Africa began to collide with Eurasia 50 million years ago, the seafloor of the ancient Tethys ocean began to buckle and rise. Beirut is built on a peninsula that juts out into the Mediterranean from the Mount Lebanon mountain range, which is actually a huge anticline. Mount Lebanon is separated from the next anticline, the Anti-Lebanon Mountains, by the Bekaa Valley. More recently, as Arabia began to rift from Africa, Lebanon has begun to fault. As water works its way through the faulted limestone, fabulous caverns form. A beautiful example is the Jeita Grotto, 20 kilometers north of Beirut. Jeita is the longest cave complex in the Middle East, with multicolored karst formations in two galleries that can be explored on foot or by boat. Farther north from Beirut along the coastal highway is Byblos, an important port city during biblical and Roman times. Today it's famous for its fish  not the ones swimming in the harbor, but the fossilized fish in the formations in An Namoura, Haqel and Hadjoula, three mountain villages east of town. Rare fish, octopuses, shrimp and worms from the late Cretaceous are preserved in fantastic diversity. The sites are protected and on private property, but the owners are enthusiasts and will often show visitors around. Traveling north along the coastal highway from Byblos, you'll hit Tripoli, a seaside town with beautiful Mamluk architecture and a busy souk (market). It makes an excellent base to explore Bcharre, a town in the mountains to the east. The buses to Bcharre leave regularly from Tripoli, and the ride up through the Qadisha Valley is breathtaking, with excellent views of eroded slopes revealing the folded structure of the terrain. There are hiking trails both above and within the valley, and numerous apple orchards to fuel a long walk. 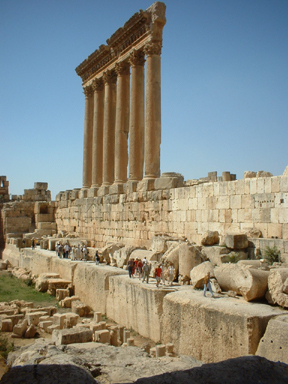 The remaining columns of Ba'albeck, the largest temple in the Holy Roman empire, is it an impressive example of Roman engineering and has undergone extensive damage due to historical earthquakes in the region. In Bcharre in the winter and spring, the other source of Lebanon's whiteness is apparent. Snow-capped mountains rise above the town, which rests at the edge of a cliff. In the winter, skiers glide past the last remaining cedar forest in Lebanon as they cruise the slopes above Bcharre, and within the town itself is a rock-cut monastery owned by Khalil Gibran. The monastery is equally interesting for its demonstration of the cave-dwelling habits of early Christians in the region, as it is for Khalil Gibran's artwork and furniture. In the warm season before the snows, it's possible to travel from Bcharre into the Bekaa Valley, which splits Lebanon down the middle. The Bekaa contains the northern extension of the Dead Sea transform fault. It's not particularly impressive from the ground, but the valley is worth a visit if only to check out Ba'albeck, the largest temple in Holy Roman empire. Not only is it an impressive example of Roman engineering with stone, but it also reveals extensive earthquake damage sustained over time in the region. From Ba'albeck, it's an easy bus ride back to Beirut. Outside of Beirut, Lebanese food, lodging and transportation are affordable by U.S. standards, and bargaining is expected.